52 children took part in this year’s Easter Egg Hunt, and, as usual, the Easter Bunny came along to ensure fair play. This was a very successful event which brought the community together with 23 different Village Organisations providing flower displays in church and 18 people opening their gardens. On Sunday 26th July 2015, the World War One Roll of Honour, which had been restored through the WW1 Commemorative Committee in the Village, was rededicated and returned to it’s position in the porch. to read more about this click here, and to see the pictures click here. We had some lovely worship and events during Advent and Christmas. Click here for a review of them. Our Harvest Week in aid of Farm Africa again this year raised £1053.56 for the charity. Thank you to everyone who supported the supper and auctions. It is 100 years since the outbreak of world War I and the Hanslope Historical Society together with the Parish Council and the Church have set up a World War One Committee. Please click here for an update on the plans. We are grateful to Andy and Sue Grout and all our garden hosts for organising this event in June. We raised £802.79 for the General Fund. Please click here for a more detailed report. This event was great fun and raised £750 for the General Fund. Click here for a more detailed report. Please click for our Annual Report 2013 and click here for the results of the elections. This annual event held every year on Easter Monday raised a record total this year of £559.79 for the General Fund. 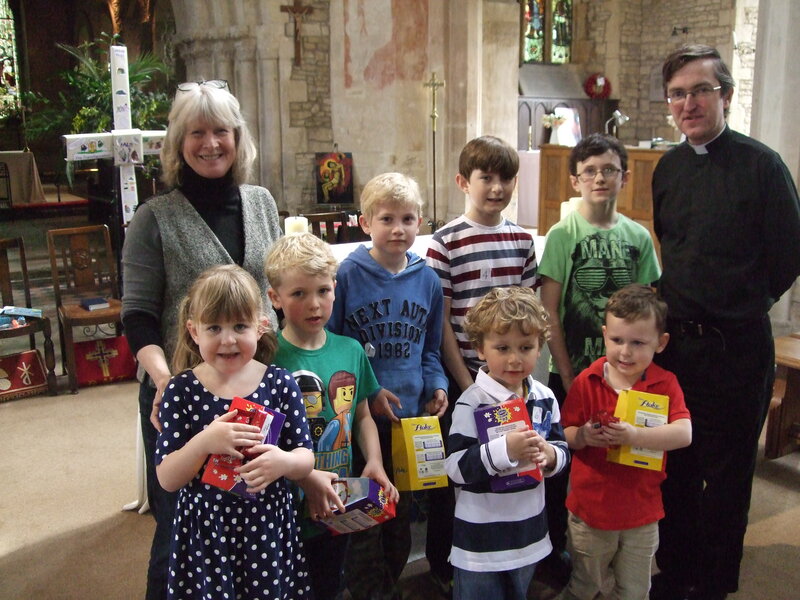 61 children took part in the Easter Egg Hunt and the winners are pictured to the right. Meanwhile, people enjoyed having lunch of Bacon Butties, hot Dogs and cakes. The raffles, tombola, cakes and other stalls did very well, and the name of the rabbit was correctly guessed as “Peter”, so our Easter Bunny went off to the lucky winner. Our Advent Extravaganza held on Saturday 30th November was well supported and raised a record total of £745. A much needed boost for the churches general funds. Our grateful thanks to everyone who came along and supported the event. 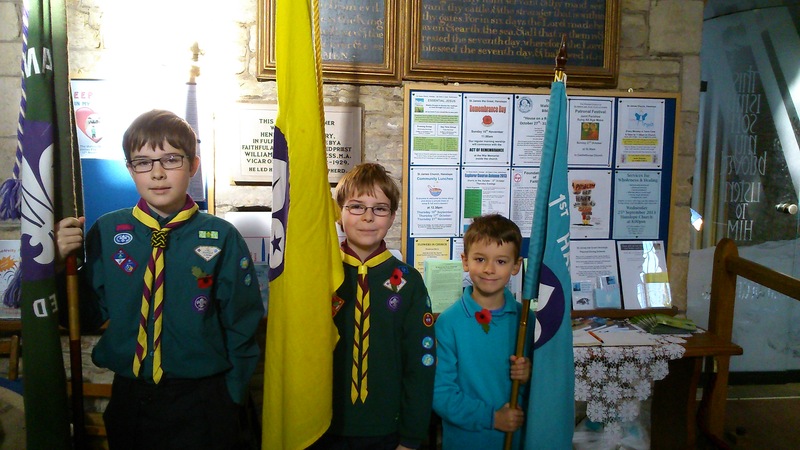 We had a record attendance at our service for Remembrance Sunday on 10th November 2013, including good support from Scouts, Beavers and Cubs – pictured here are those chosen to present their flags for each of the organisations. 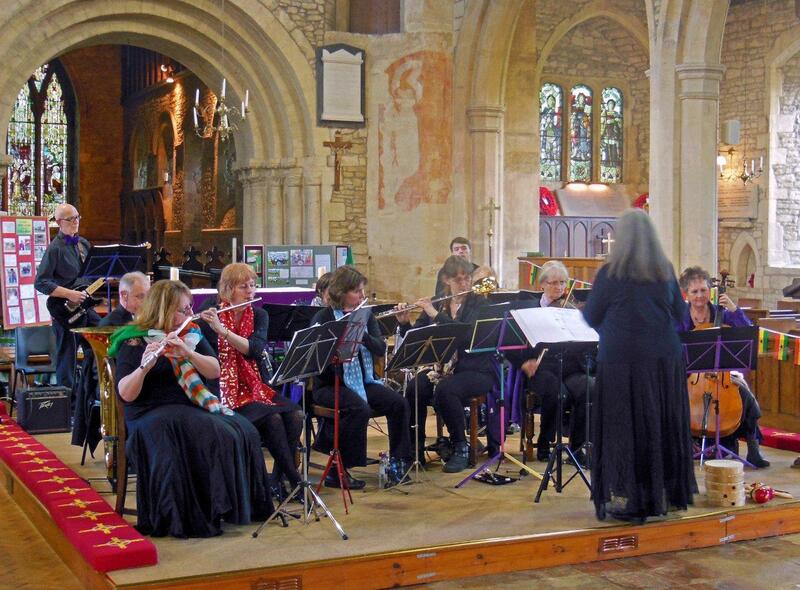 Our 2013 Open Weekend in July raised over £1,300 for the General Fund. STRAWBERRY CREAM TEAS were served on the 7th July 2013 raising £412 for the Diocese of Ho. LENT LUNCHES 2013 This year’s Lent Lunches have raised a mammoth £820.06 for FARM-Africa. 8% more than last year’s record total. Thanks to all concerned. EASTER EGG HUNT AND FAMILY FUN DAY2013 50 children took part in the Easter Egg hunt this year on a cold, but dry Easter Monday. Bacon butties and cakes were enjoyed and the stalls did a good trade. The name of the teddy bear was Walter. We raised £460.67 for the General Fund and are very grateful to those who helped with the event and those who supported it. Thank you.